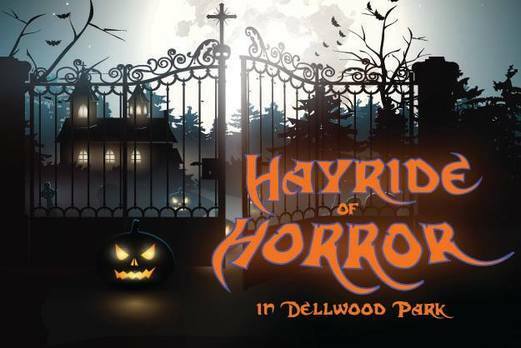 A brand new haunt for the Tourers, Hayride of Horror started out as quite promising, with a nice, wooded setting populated by some great wait entertainment. We encountered a giant Jason Voorhees, who stalked back and forth through the crowd, as well as Carrie, a girl who looked like Regan from the Exorcist, and a girl with a creepy doll. All of them stayed in character the entire time, and seemed to do their own thing, regardless of whether or not anyone was watching. They made for some entertaining moments while we waited to board the hay wagon. Unfortunately, the wait entertainment turned out to be the best part of the actual haunt. The hayride itself was lengthy, clocking in at about 20 minutes, but not a lot happened. Basically, we wound up riding through a lot of open space waiting for a new scene to appear or for an actor to pop out. There were some attempts at creating atmosphere, from rows of burning torches along the tree line in some areas, to eerie red lighting under the bridge that visitors walk over as they make their was to the wagon, as well as some nice laser lighting reflecting off of the trees in various locations. Most of the ride consisted of open space, though. Scenes, when we did encounter them, mostly consisted of static sets, with a few occasional actors. There were no actors that popped out along the way, either from the trees or from anywhere else, and the actors in the various scenes seemed to be just going through the motions. Some actors seemed off their marks or unsure of exactly what to do, and a couple of things took place behind the hay wagon or along the opposite side of where we were sitting, but close enough so that we couldn't see what was going on. Not a lot of enthusiasm was on display, except for the final group of clowns, who all seemed to be into their roles. That said, there were some clever parts, such as a group of graves that were actually dug deep into the ground. So deep, in fact, that actors were able to actually either crouch or lie down in them and not be seen. These were lit by red lighting, and looked pretty good as actors came out of them. Also, there was a nice looking shack in the woods, with a female victim and a chainsaw wielding maniac that came out, but he moved quite slowly and didn't seem very threatening. Perhaps the best part of the hayride was the hologram that was projected onto some trees in the background. From a far it looked like a ghostly figure walking out in the woods. She could be seen from two different angles as well, and the fact that she was simply in the background made it all the creepier. Overall, the hayride was fun and enjoyable as a nice ride through the woods, but it was disappointing in terms of the actual scenes and the actors in them. Also, there is the question of potential wait time. There was only one hay wagon when we visited, and it took us about 30 minutes to get on it, and the hayride itself is about 20 minutes plus another 5-10 for the rules and loading/unloading the wagon, so if crowds are large the wait times could be long. We can't help but feel that if someone waited a long time in line to get to the actual hayride that they might feel somewhat let down by it. We'd love to see the Hayride of Horror grow as the years go by, and we feel that it could develop into something more if there was some more atmosphere, more actors, and some more surprises along the way. However, at the moment it's more of a pleasant ride in the outdoors than an actual haunted Halloween event.